Seattle-area cyclocrossers gathered last Sunday at Marymoor Park for the opening event of the 2011 Seattle Cyclocross series beneath unexpected sunshine, courtesy of the high winds that drove the storm clouds before they had much of a chance to unload their cargo of moisture. But any unanchored tents were at risk of suddenly sailing across the parking lot, while the normal race-day hubbub was periodically punctuated by the percussive vibration of the course marker tape whipped into harmonic oscillation. 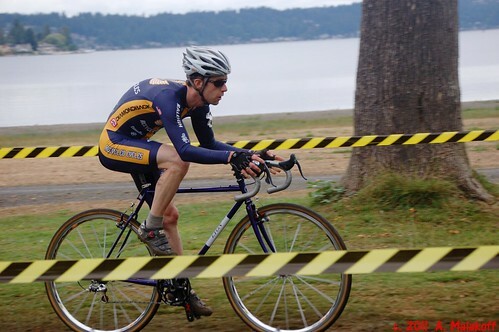 The course had been knit around the Marymoor velodrome, reprising some lines well-known to veterans of the Seattle cyclocross scene. Long straight sections outside the velodrome grounds led into a twisting maze of yellow tape that rose and fell along the velodrome’s exterior embankment, in a mix of off-camber swerves and swooping hair-pin turns. A summer under the sun had roughened the dry ground into a knobby and rutted surface that rattled and jarred joints and bones. Two pairs of barriers forced riders from their bikes: one set at the end of a stretch of tarmac required a dismount at speed; the other, placed right after a hairpin turn, forced the riders to a near-halt as they tried to hop off before the impending encounter with a large piece of wood; not all attempts met with success. The Recycled Cycles crew had set up early enough to score a prime piece of real estate along the course close to the start line. The mounting wind forced an early removal of some banners that threatened to become sails, and we soon had to anchor the tents to the Recycled Cycles van with a variety of ad hoc lashing. First to set off from the RCR contingent, Tyler represented in the ever-growing Cat. 4 Men’s field, winding up with a mid-pack finish, but happy with the improvement in his sensations produced by his increased training load. His race done, he fired up the barbie for the first round of sliders from Bill the Butcher’s grass-fed organic beef. Team members drifted in over the course of the day as the event progressed through its schedule. 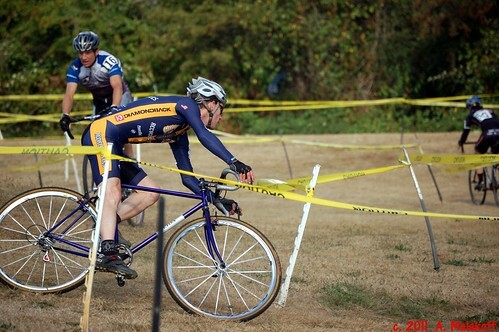 Ian, though not racing, spun over on his road bike and lent a valuable pair of hands in support during the day, schlepping wheels to the pit, helping to anchor the tent, ringing bells… Julie arrived with young Sam in tow for his cyclocross intiation with the 10-12 junior field. Alex showed the RCR colors in the noontime 1/2 race, while his lady friend performed yeoman’s service with the tent anchoring crew. The 1:30pm race featured six different fields, with the largest rcr participation of the day: David showed off the blue-and-gold amongst the single-speed crowd, his kit accessorized by some awesome skin ink; at the start line for another season with the Cat 3 45+ men, Andrew spotted a few faces remaining from the old Master B days; Beth and Julie joined the Cat 1/2 women’s field, and Jamie took up the challenge with the Cat 3 Women. The black wall of cloud which had been threatening off-stage southeast finally arrived to hide the sun; the cold drops began to spatter jerseys, raising gooseflesh and shivers among an under-dressed crowd. But a lap into the race, the clouds passed, the sun was out, and though we were all wet, ’twas in a good way. At the end of the first lap, Andrew barely managed to get out of Beth’s way as she muscled through the old men on her way to a convincing win in the women’s field, while Julie hung tough for a ninth-place finish. Sent off a mere thirty seconds after the start of an overstuffed masters field, the elite women had had to thread their way through the whitebeards before moving on to overtake the graybeards. Jamie overcame some tangles with the terrain to finish with an excellent showing in fifth place among the Cat 3 women, though ruing the mishaps that pushed a potential spot on the podium just out of reach. The closing race of the day beneath the increasing sunshine featured the men’s open Category 3 field, with CarlA and NickB. Racing around the course amid a select cluster of riders, Nick improved on his showing of the previous week with a seventh spot on the results board. As all the fun and excitement was taking place out on the parcours, the post-race post-mortem and hoedown was going strong back at the tents, fuelled by some more grilled meat from Bill the Butcher, and whatever else folks happened to bring. Finally, it was time to stow everything back into the truck and leave planet cx for the trip back to Earth. Next Sunday, October 2nd, come on out to North Bend as the fun resumes with the MFG race presented by the Seattle Cancer Care Alliance. 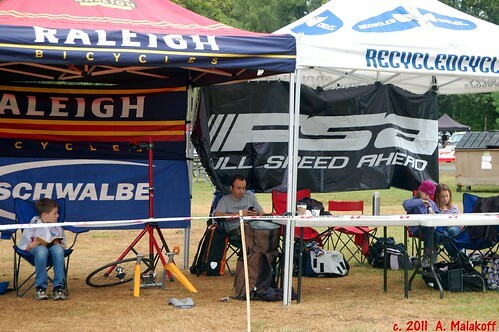 We’ll have the fleet of Raleigh demo bikes on hand for a test-drive under real racing conditions. The late blast of summer heat and sunshine gave way to gray skies and drizzle in time for the Rapha Grand Prix on September 18, the Sunday conclusion to a weekend double-header of cyclocross which had begun with Saturday’s Starcrossed; headlined by UCI-sanctioned races for elite men and women, both days also featured a set of opening races for a mix of amateur categories and age-groups. 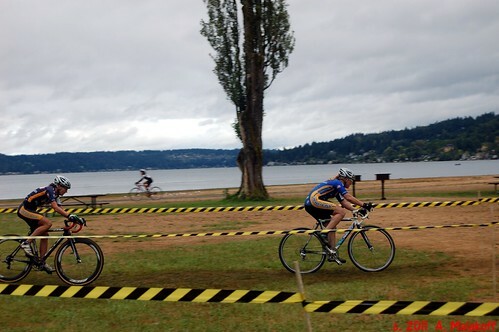 Set in a state park by the silvan shores of Lake Sammamish, east of Seattle, the course snaked its way among the trees on rain-slicked grass and mud, with a few tight curves to trap the unwary, before heading to the lake-front where two sections along the strand compelled racers to hoof it through the sand. 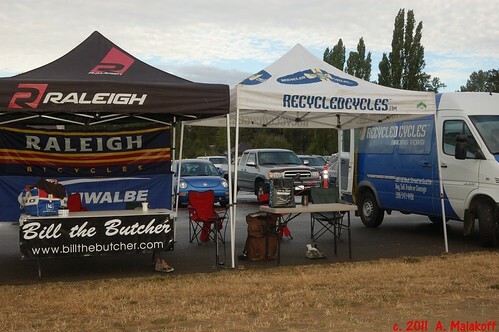 The Recycled Cycles Racing crew had set up base camp in a prime space in the vendor section along the course, where we featured the Raleigh demo carbon cross bikes. The RCR ladies squad showed up in force, bringing offspring and canines to add a welcome family ambiance to the tents. And we were happy to have the tents beneath the changeable weather, with intervals of drizzle giving way to the occasional sun-break. The women got things off to a bang-up start with Rebecca’s win in the Cat. 4 women’s field. Then RCR owned the podium in the master women’s race with Beth, Julie, and Liz finishing 1-2-3 while Ali rode hard to finish just out of the top ten. Eric watched Beth cruise by him as he rode to a 6th place in the Cat 3 55+ men’s field. The next set of waves saw Carl start with the Cat 3 Men 35+, Andrew with the Cat 3 Men 45+, and Jamie with the Cat 3 Women. Andrew thinks he has never seen a field that big; thanks to the sand, he was able to make his way from the back of the pack to the middle of the field. Jamie added to the women’s successful showing with a 6th place. RCR’s last representation for the day was furnished by Nick B who claimed a 10th place amongst the Cat 3 men, and Busto who lined up with 76 (!) 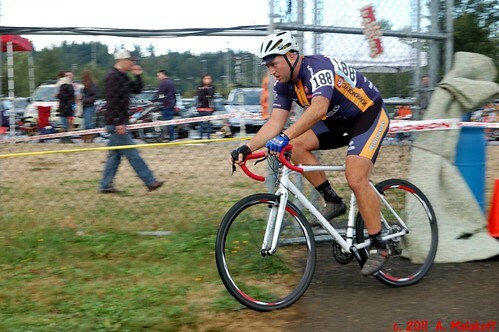 other single speeders in a stacked field dominated by Craig Etheridge and the Fountain Brothers. The amateurs done for the day, we got to kick back and watch the pros conduct master classes in power and style. Katarina Nash rode away from the women, while the Belgian duo of former World Champion Bart Wellens and his up-and-coming teammate Rob Peeters dropped the hammer on the men, leaving current US champion Todd Wells and former multiple champion Jonathan Page well behind. RCR’s next rendez-vous with the mud takes place on Sunday September 25, as the SCX series kicks off for the 2011 season. 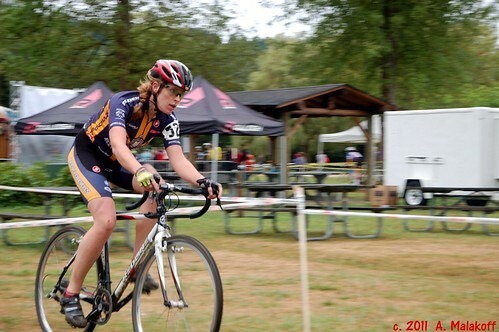 Here at Team Recycled Cycles Racing, we are pleased – no, overjoyed – to announce the long overdue arrival of a contingent of strong women, who’ve joined us just in time for the 2011 cyclocross season. Welcome, ladies! 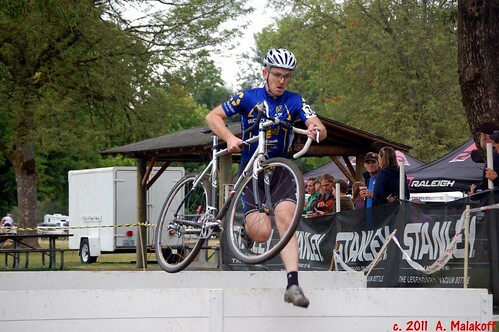 And for the first episode of their adventures with their new team, we have Beth’s report from the Labor Day cyclocross season opener. 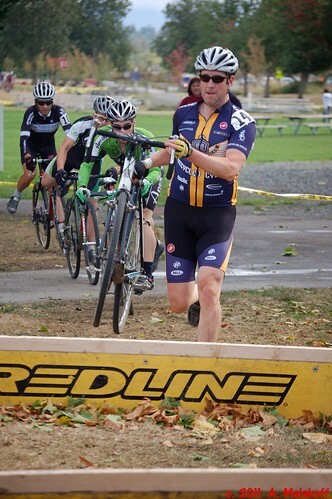 Last Monday, it was four freshly-minted members of the RCR/women’s cross team who showed up for the first race of the cyclocross season: ” The Labor Day Bone Shaker”. The race was NOT the typical ‘cross race: a course consisting largely of bouncy grassy turns, on a day that was 85 degrees hot, in air full of dust. Two of the ladies entered the cat. 4 race. Heather finished well with a mid-pack placing, though her gloveless hands were decorated with open blisters raised by the bumpy course. Rebecca did well for her very first cyclocross race, and even decided she’d do more cross after such an epic opening day. We promise her better courses if she sticks with it. Julie and Beth were in the Cat 1/2 field, with a grand total of seven women. Since Julie was swimming in a size small RCR jersey, she wore the long-sleeve RCR skinsuit for a slow bake over the course of the race. As it was still Labor Day, Beth could still wear a flowing summer white jersey without committing a fashion don’t. It was an exciting first minute of racing for Beth: despite a pedal bobble at the start that cost her the hole shot she prefers, followed by a less-than-helpful shove from a former teammate as she tried to sneak up along the tape , Beth managed to managed to get into second place by jumping past local stalwart Kristi Berg. “I am not really easy to push around”, she warns. Julie was psyched for the race as her riding had progressed significantly now that she and Beth were training together. Though Julie’s race didn’t end as successfully as she would have liked, she deserves the award for the gnarliest and toughest racer of the day. On the first lap, she was right up there with the pack until a hard crash on a technically challenging off-camber downhill left her battered and bloody, with deep cuts to her knee and forearm. 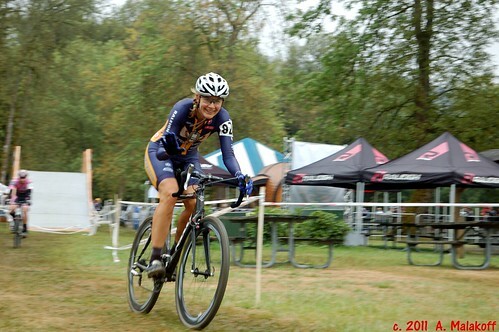 But despite the mishap, Julie managed to chase back into fourth place – only to flat on the third of five laps. Running to the service pit, she had to search for her spare wheel, then suffer through a slow wheel change; she nevertheless made the fateful decision to carry on to the end. Once across the finish line, Julie first had to attend to her waiting boys before making her way to the aid station, so the medics could dig the dirt out of her wounds. But while tending to her injuries, she somehow forgot about her overheated body’s need for fluids, and the medical triage thus progressed into treatment for a heat stroke that came complete with shakes and serious wooziness. Thanks to the assistance of various folks with some medical background, Julie recovered without serious consequences, but Beth did take the precaution of driving her and her boys home. Stay tuned for further tales from the cyclocross season. Team RCR will have Raleigh bikes available for test rides at the forthcoming races; stop by the RCR tent with valid id and your favorite pair of pedals.